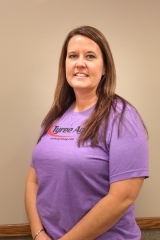 Molly became a Tyree Ag employee at the Laverne location in February 2009. She grew up in in a small, mountain town in Colorado and later moved to Manhattan where she obtained her Bachelor’s degree in Animal Sciences in 2001 from Kansas State University. Molly was married to her husband, Reid, in 2002 and moved to Oklahoma in 2007 where they now live with their three children – Teegan, Tripp, and Tinsley. Molly has also worked hauling fertilizer and taking care of the warehouse but now with the help of additional employees, serves as the office manager.